On a quiet evening, under a light blanket of fresh snow, the outskirts of Toronto ’s Pearson Airport seemed like the perfect playground for my press tester of the week: a 2015 Acura ILX in Dynamic trim. 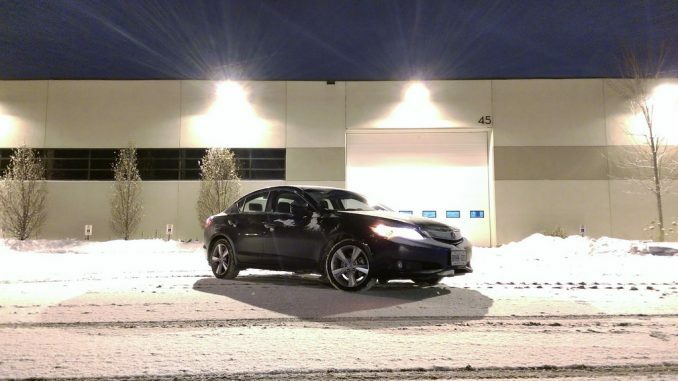 Finding empty industrial area back roads to row through the butter smooth 6-speed manual transmission and revving the ILX Dynamic’s 2.4L four-cylinder motor past 6,000 rpm for that sweet symphony of engine and exhaust notes while hooning on snow covered parking lots was utter driving bliss. Toronto’s seen a lot of snow this past week, which has meant a lot of hooning in parking lots. Donning winter tires, this lightweight front-wheel drive luxury sedan with its phenomenal powertrain has become an unlikely winter time favourite for me. Coming to an end of its life-cycle, this first generation Acura ILX is about to be replaced with a completely revised 2016 model. But from 2013 to 2015 model years the ILX was known as the smaller, entry level Acura that was built on a Civic platform. That salient latter point has simultaneously been the source of ILXs biggest strength and loudest complaint. ILX is not a vehicle that makes much sense in its $28,190 base trim. Do so and that Civic comparison might hurt when you consider a mid-range Civic EX comes similarly equipped for $6,000 less and has a far superior CVT transmission to the ILX’s archaic 5-speed automatic. Option up to the ILX Technology package priced at $32,290 and you’ll be treated to everything from a leather wrapped cabin to a premium 10-speaker audio system and navigation. This still doesn’t move the ILX any closer to a best buy in the compact luxury car segment. Ringing in at the same price as the Tech package, the $32,290 Dynamic trim ILX transforms this otherwise bland and unremarkable sedan in to one of the most exciting value priced luxury cars I’ve driven in a long time. As a motoring enthusiast, there are a few things I like to see in a daily driver. Foremost is an inspiring drivetrain, front-wheel or all-wheel drive (RWD on snowy/slushy roads is often more worry than joy), followed by at least a few basic creature comforts and some well sorted in-cabin tech. 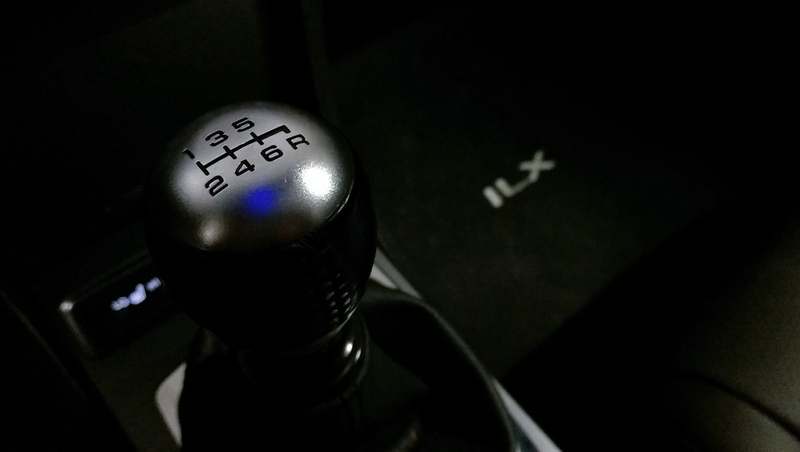 With the ILX Dynamic what you get is all the spectacularity of the 201 hp Civic Si motor mated to the marvel that is a its 6-speed gearbox wrapped in a luxurious package. As an added bonus, Acura manages to keep the overall weight of the ILX Dynamic to 1,359 kg, just 10 kg more than the sporty Si. The ILX Dynamic comes equipped with heated, power adjustable seats with lumbar support for the driver. Yes, I’m mildly arthritic, so adjustable lumbar support and heated seating matters a lot in a daily driver. It’s also got heated mirrors, sunroof and dual zone climate controls. There isn’t a long list of features here, it’s just not the kind of thing Acura is known for in an entry level vehicle. There is one very much liked bit of tech however: mounted atop the centre console an 8-inch screen is home to the in-car navigation system. The screen which is sunken into the stack has its own sun visor surround and is easy to read even in harsh light. Smartly placed analogue controls for navigation, audio and climate mean you don’t have to take your eyes off the road to use them. Touchscreens aren’t the holy grail of motoring tech, sometimes refined buttons and knobs just makes infinitely more sense–Cadillac, I hope you’re listening. Let’s say the feature minimalism in the cabin of the ILX Dynamic is intentional on Acura’s part, because when you have a powertrain this good, you really don’t want distractions. Photographs with a cell phone by Kanishka Sonnadara. Click to read about Automotive Photography with a Cell Phone.